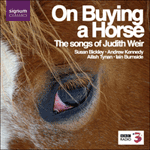 On buying a horse (1991) was written for a concert given in aid of an animal charity. They probably weren’t crazy about this quick blast of peasant cunning, which advises anyone offered a horse with the wrong markings to 'tear off his hide and feed him to the crows'. Take off his hide and feed him to the crows.